I don't know how it got to February and I still haven't done a running recap for last year. It was a good year, in spite of an injury in October that almost shut down my running. I ran more than ever before, for a total of 1850 miles. I also did a running streak. This is where you don't take any days off. So you must run every single day, for at least one mile. I had two days that I found this exceptionally challenging. The first was in January, when I was sick with a fever and sore throat, and had to run on the treadmill at 5:30 am. That was rough. The second was in November, on the day following the CR24 (in which I covered 33 miles) when my IT band was really hurting from injury and the rest of my body was very sore. That was a rough mile too. But I stuck with it. This was the first time I ever attempted a running streak. So it was a good year. My favorite run was the 9 miler I did in the desert in Arizona, around 4:30 am last summer. It was amazing! I don't have any recent pictures of me running. So here's a picture of Pierce hanging from the ceiling. Because that totally makes sense, right? Oh my, you are strong, brave, and a real fighter! We really need to give a camera to Pierce so he can take photos of you on the treadmill. Love that picture of him though! Runners always impress me..whether the distance or the frequency. I can't run..it is just not easy or pleasant for me. But...walking...I can do that. I can't wait to get back out on the trail this spring after my feet heal from surgery. I'm READY! Bring on the nice weather for walkers and runners! Wow! That is a lot of running! I can't imagine running after completing 33 miles the day before- or running while sick. 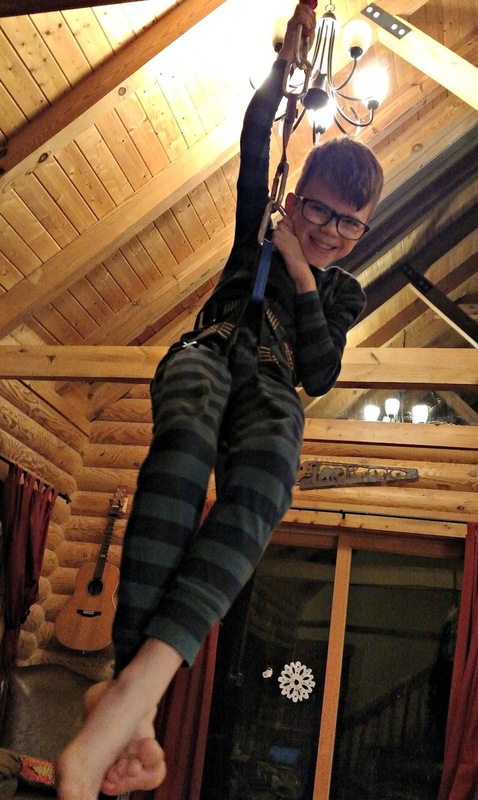 Aww...he's so cute hanging there! I hate running or exercising when I'm sick. You certainly rock it! You did great with these goals. All the best! That a cute picture of Pierce. You're awesome! I didn't know what a running streak was but that's super commitment--especially when you're sick!! Congratulations. That run in Arizona must have been spectacular!